The current E&P industry downturn has greatly reduced E&P spending. 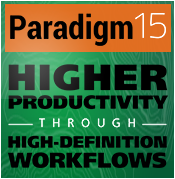 Most organizations are frozen in place with the software they were using in 2014. This reaction is understandable, but E&P remains a highly competitive industry. Only those companies that have up-to-date tools are going to prevail and create value for stakeholders. There has been a shift over a period of time in geophysical visualization technology, yet a large number of interpreters are still using older software which lacks the “new basics”. These new basics include RGB and HSV blending, as well as a geological time (Geo-time) consistent interpretation framework. The intent of this blog post is to sound a “Call to Action” to all companies that are still using the old technology, to urge them to move onto more modern platforms quickly. What do we mean by RGB and HSV blending, and why are they important? RGB refers to the red-green-blue color map, and HSV to the hue-saturation-value color map. 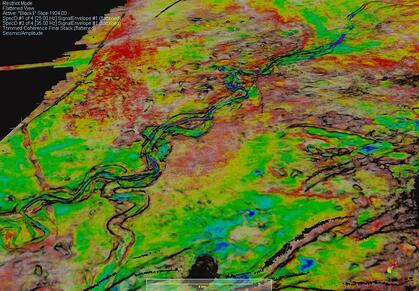 We can use these color maps to blend up to three seismic attributes at a time. 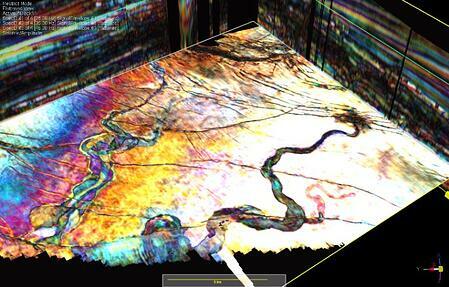 It is important to remember that blending technology can be applied to 2D or 3D seismic volumes, or 2D grids (maps). It is also possible to use subtraction or multiplication of any two attributes as another blending technique. Low, middle and high frequency band outputs from Spectral Decomposition, used to visualize stratigraphic features (RGB or HSV). Three seismic cubes, with -1, 0, and +1 vertical sample shifts, used to visualize stratigraphic features. The shifts do not have to be ±1, other values may be used (RGB or HSV). AVO intercept and gradient (subtract or multiply). P-Impedance, Vp/Vs Ratio or Poisson’s Ratio (subtract or multiply). Coherence Cube is always a good attribute for edge detection, and it works well as the “V” channel of HSV, with “H” and “S” choices left to the interpreter. Figures 2, 3 and 4: Offshore New Zealand - a horizon flattened view. Figure 2 - Conventional PSTM seismic used to visualize channels. Figure 3 - RGB display of low, middle and high frequency Spectral Decomposition signal envelope hands, used to visualize channels. Figure 4 - HSV display of middle and high frequency Spectral Decomposition bands and Coherence, used to visualize channels. 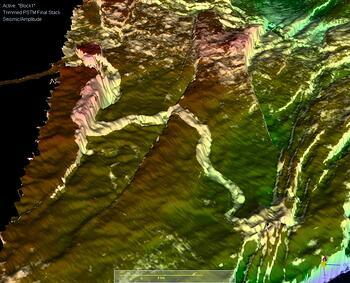 Figure 5 - HSV blend of three seismic attributes extracted along the Sognefjord Horizon, North Sea. The attributes are low and high frequency Spectral Decomposition bands for H & S. The Coherence Cube controls the dark shading provided by channel V, which darkens faults. Note how both channels and horsts and grabens are enhanced. As we can see from comparing regular seismic (Figure 2) to RGB and HSV displays (Figures 3-5), there is a large uplift in interpretability when using RGB and HSV technology. When using these color wheels, all of the geological information conveyed by the three attributes is spread out across many colors, greatly increasing the usable dynamic range for the human interpreter’s eye. This means that you can see subtle variations in stratigraphic and/or structure that are less easy to discern on any single attribute. In general, seismic data must be flattened on multiple horizons simultaneously, not just one horizon, in order to perform a stratigraphic interpretation on time or depth slices. Almost every seismic interpretation software can flatten on one horizon; not all can flatten multiple cubes at the same time, on multiple horizons. 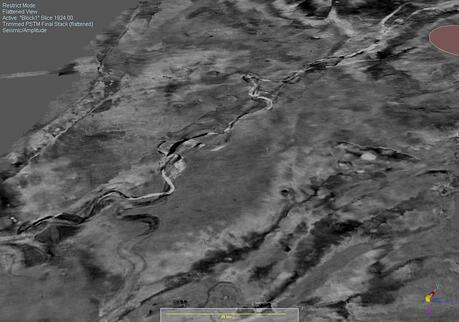 Multi-horizon flattening is very important, because while sedimentary rocks were all deposited at nearly zero or low structural dip rates, in the present day, due to folding, faulting, tectonic tilting, or subsidence, the rocks are now dipping. The advantage of this operation is demonstrated in Figures 6 and 7. In Figure 6, the meandering channels are clearly depicted in their entirety; on the other hand, in Figure 7, notice how the representation of meandering channels in Figure 6 has been obscured by the fact that today, the channels traverse across fault blocks, enabling us to see only pieces of the channels. Figure 6 - Seismic amplitude display flattened, used to improve the visualization of channels. Offshore New Zealand. Figure 7 - Seismic amplitude display unflattened. 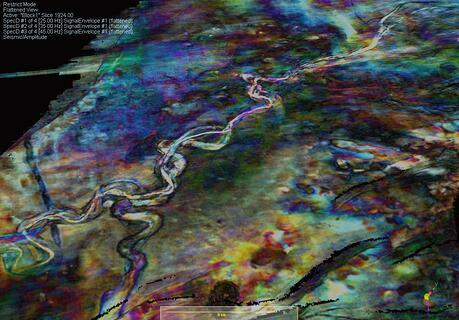 Notice how channels seen in Figure 6 are broken up over various fault blocks, and are quite difficult to interpret. Offshore New Zealand. There is another way to solve the geo-time consistency problem, and that is to extract seismic attributes along a “fan” of dipping horizons that vary proportionally between a user-specified top and base. In Figure 8 we see the same channel as in Figure 6, but viewed in the context of present-day structure. One stratal or proportional slice was selected for display from a “fan” of five slices through a seismic volume based on user-defined top and base. This is a useful display if the interpreter wishes to understand not only the stratigraphic bodies, but their present-day structural configuration, in order to see if there may be structural enhancements to stratigraphic traps. 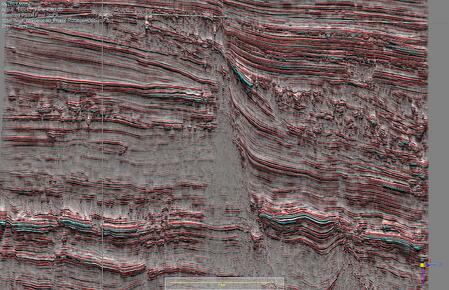 Also, the scene can be rotated in 3D in order to understand how the stratigraphy interacts with structure. Figure 8 - Same channel as in Figure 6, but viewed in the context of present-day structure. 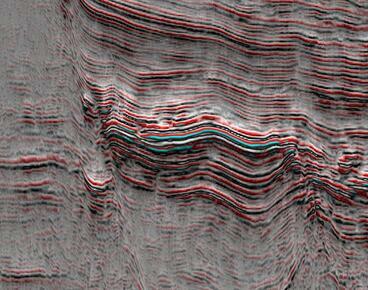 Seismic PSTM amplitude (black/white) co-rendered with seismic two-way time (rainbow). Green = deeper, red = shallower. The light editor was used with three active, oblique light sources to enhance the channel. Offshore New Zealand.We need not limit the application of blending to horizontal slices. In Figures 9 and 9a we see a dramatic application of blending a regular PSTM seismic amplitude (red-black) with a user-defined amplitude (greyscale), rendered on a vertical inline section. The blending of the two gives the visual effect of viewing a physical outcrop with differential erosion on the exposed rock face. Where there is extreme visual “overhang”, the two color tables combine to create a turquoise blue highlight. The user-defined attribute consists of these trace processes: Absolute value / scalar + phase rotation -90 degree + Debias. Figure 9 (left): Inline view of two seismic volumes with PTSM (black-red) and user-defined (greyscale) amplitudes, blended using the subtraction method. Offshore New Zealand. Figure 9a (right): Detail of portion of Figure 9. 3D seismic interpretation workstations have been in use for a generation, as the famed AAPG Memoir 42 was published in 1986. At that time, the use of inline, crossline, horizontal slices, and arbitrary lines was state-of-the-art. 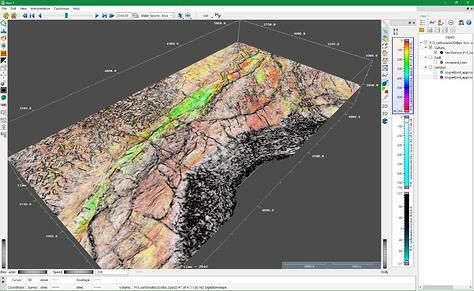 Over the past decade, true 3D interpretation canvases, which display wells, seismic, grids, fault and horizon interpretations, and models have become increasingly popular. The reason why these 3D canvases are popular is that they allow the user to escape the trap of interpreting on flat sections, which gives rise to the temptation to interpret “every line as a dip line”. 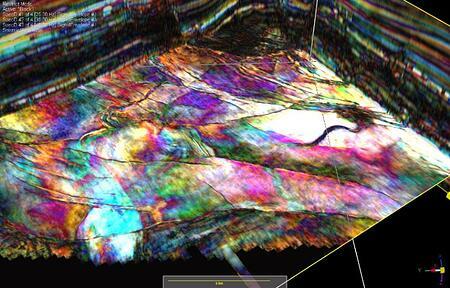 In addition, faults cutting through the section at shallow angles can be very hard to recognize. The use of only vertical sections can cause the interpreter to make inappropriate judgements about geology. For example, an interpreter might conclude that a salt body contains “inclusions” of sediment, when in fact there are no inclusions at all; rather, the salt body simply has a complex shape and moves in and out of the vertical plane of view. Providing interpreters with the ability to work on a truly 3D interpretation canvas enables them to avoid these traps and frees up creativity. At Paradigm, our motto is “Advanced Science for Everyone”. We believe every interpreter should be using the advanced interpretation tools shown and discussed in this blog. We consider a broad deployment to be better for an E&P company than having a few copies of a specialist advanced visualization and interpretation package. The problem with using a specialist package is that it requires learning another user interface, and necessitates the movement and duplication of bulky seismic. What is key to Paradigm’s offering is that it is part of our SeisEarth interpretation platform, using the Epos data repository. There is no need to move and duplicate data, or to learn another user interface. You can interpret right on top of our RGB HSV displays, flattened or unflattened. Eventually, recovery will return to the E&P industry. When it does, companies will be looking for both conventional and unconventional opportunities. Those with the best tools will have the best chances of receiving investment capital and adding value for stakeholders. Paradigm invites you to investigate equipping your interpreters with an upgraded toolkit now, because the (color) bar has been raised.